Although this species is almost confined to the fenland areas of Norfolk, Suffolk and Cambridgeshire, it has also been recorded from Shapwick Heath (Somerset), marshes east of Swansea (West Glamorgan) and there is an old record from Dorset. In Europe it is widespread but rather local in wet habitats generally, rather than being confined to fens. Generally a species which is found in open fens, where females spin a cocoon in heads of Phragmites. It is also found among lower vegetation. Adults are most abundant in May and June, but a female has been collected from litter at Chippenham Fen in October (D. Carr, pers. comm.). Marpissa radiata is widespread and may be fairly common in some of the fens of East Anglia, but is apparently absent from areas that seem suitable. The most significant threat is loss of open fens through drainage, the detrimental effect of lower water tables across large areas of East Anglia or invasion of scrub vegetation. 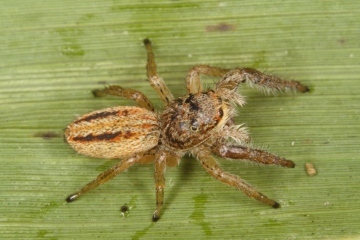 A high proportion of the sites where this spider has been recorded are relict fen sites, with a long continuity of habitat. As with ancient forest, once lost or severely degraded there is no quick and easy means of restoration (Bob Merritt, pers. comm.). Management should maintain open Phragmites beds by controlling scrub growth and maintenance of a surface water table are necessary. Traditional reed-bed management should be encouraged where possible.